The first time I read those words of Thoreau, I knew something about them was fundamentally true for me. The times in my life when I’d felt happiest, were the times of freedom. The times of being myself with no one asking me to be otherwise. Times in nature—in the woods, in the desert, on the beach, catching craw-daddies in the creek as child, living for months at a time in a tent, traveling, breathing fresh air. What we ultimately want to offer our children is exactly this sense of freedom to be you. That is the most profound transmission. From that arises confidence, bravery, and ultimately compassion. From that arises a willingness to relate to things as they are, to work with one’s own mind, and to engage in meaningful work. When I asked some of the children how they felt this past weekend, “Free!” was a common response. 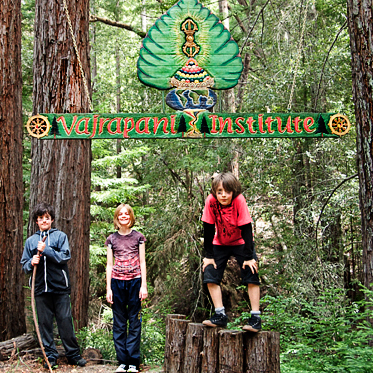 We just spent the weekend in the Santa Cruz Mountains, surrounded by redwood forest, at Vajrapani Institute, a Tibetan Buddhist Retreat Center. Children, parents, and staff all stayed in tents on the land. This was the final Rites of Passage session before the final ceremony which will happen on May 31, 2014. Part of Rites of Passage (for 8 to 12 year olds) is that we trust them more. When we have confidence in our children, they are free to have confidence in themselves. So holding the program at a retreat center was the perfect container for letting go. They were wild and free. And I’ve never seen so many genuinely happy children. Vajrapani offers a beautiful gompa or meditation hall, where we gathered in the mornings, after lunch, and in the evenings for meditation practice and discussion time. We talked a lot about the themes we’ve been exploring together since February: the five senses, the four elements, and the qualities of bravery, confidence, and compassion. 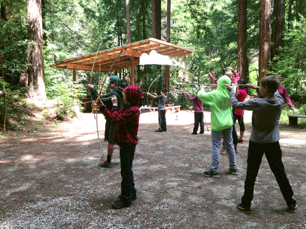 During activity times, the children learned kyudo (archery) and ikebana (flower arranging). They made their bows from bamboo, and sharpened dowel rods with pencil sharpeners for arrows. It was incredible to see their rapt attention as Lucy Halverson instructed them on how to shoot an arrow with the mind of meditation. One child told me that shooting the bow made her feel strong. Rachel Anderson guided the children through ikebana. When she offered the children the chance to create their own arrangement instead of following the form she showed them, most of them did just that. It was delightful to see their hearts shining through – from braided curly willows to rose petals suspended on the fringes of an arrangement to an entire redwood forest in miniature, complete with a daddy long leg. The transmission was there: we trust you. You are so good. Look what you can create! The activities were surrounded by lots and lots of space. Free time is where the rest of the magic happened. The unstructured time, where the children were not expected to check-in, engage in anything specific, or report their comings and goings to anyone. They could just be there as they wanted to be. I witnessed baseball games, nature explorations, stick games, races, mining, reading, and my favorite—the war paint tree. There was a huge redwood that looked like it had been struck by lightning. The part that was left of it was blackened and charred, but if you rubbed your finger along the black parts, it was like kohl (think Cleopatra). You could make marks on your face however you liked. The weekend was punctuated by trips to the war paint tree. I had the great fortune of being painted by several of the children, and the great fortune to paint them as warriors as well. And this sums up the feeling so well- we were all experiencing our strength, bravery, and independence, and proclaiming that to the world. The marks on our faces were just an expression of that. I include myself here, because I feel like they were teaching me about loving myself too. Meanwhile, the parents were together exploring Parenting as Path with Susie Cook. They had a chance for practice, discussion, and connection around parenting. And around their own rite of passage—letting go of their little child in exchange for the growing human who was there, with the tools to be more independent and have more responsibility. Everyone had ROTA assignments during the retreat, too. If you’ve never been to a land center program, ROTA stands for rotating opportunities for transcendent action, and is another way to say chores. 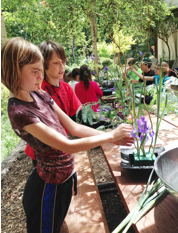 I witnessed the children transform in their relationship to their work, helping each other complete chores, finding joy in their tasks, and even volunteering for extra shifts! Together, we kept our container clean and beautiful, and were able to care for each other in a really powerful way. On Saturday night, we had a campfire. It seemed like it couldn’t come quick enough! Or at least the marshmallows couldn’t. We had to practice a lot of patience to wait for those 3 marshmallows per person. But it was worth it. Many of the children offered stories or riddles. We learned to sing We are the Warriors, a song composed by the Sakyong and the Sakyong Wangmo. And finally, we told the Rites of Passage story. I can’t tell you what it’s about, but it’s a story that is told to everyone who goes through Rites of Passage. 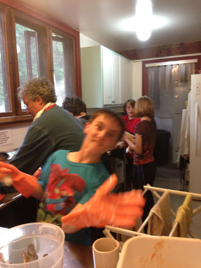 The children even helped to act it out—which was hilarious. I invited the group to share what they loved most. The children continued to offer up what they loved most about themselves. The adults were slower to share. “I am basically wise!” (peels of laughter and applause). Whew! And there we were, all shiny and feeling loved. What happened this weekend is more than Rites of Passage for the children. It’s a reflection of what it means to create a good human society. It’s a reflection of what trust looks like- when we trust ourselves and trust our children and trust our parents. And yes we offered to these children some ancient contemplative practices, parts of which will certainly impact their lives. And yes we practiced meditation together and worked with our own minds. We know the five sense. We explored the four elements. We contemplated all these concepts. But the fundamental potency of our time together was that we looked at each other through the eyes of goodness, as human beings who are wise and strong and kind. We were able to trust ourselves, love ourselves a little more. And thus trust and love others more. This, my friends, is enlightened society. And there is no place else I’d rather be. I hope you’ll come and show your love and support for these brave young warriors at their graduation ceremony on May 31st at 3 pm at the San Francisco Shambhala Center.